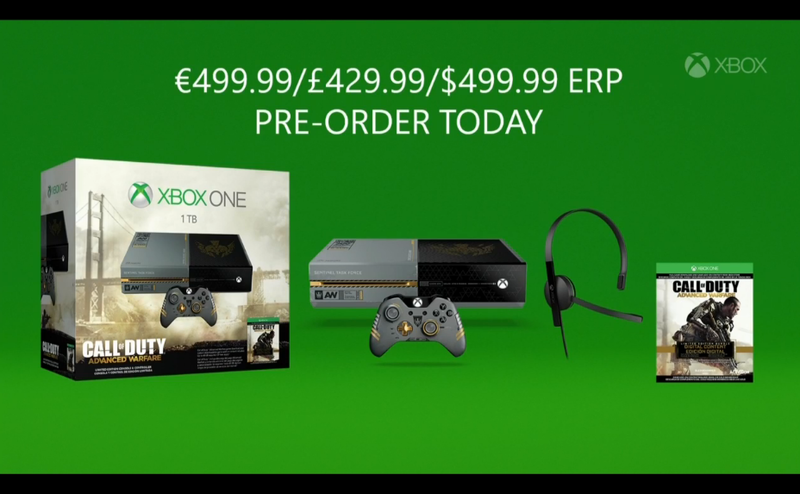 A new Xbox One bundle has been announced at Gamescom 2014 yesterday for the upcoming Call of Duty: Advanced Warfare. Phil Spencer revealed the news during Microsoft’s press conference at Gamescom. The new bundle will include a digital copy of Call of Duty: Advanced Warfare “Day-0 edition”, which lets you play the game one day before release, a custom designed Xbox One & controller, and COD-inspired sound effects. The most interesting part of this bungle is the inclusion of a 1TB hard drive and the deduction of the Kinect. This is a non-Kinect bundle and will cost the same as the bundled console. It’s pretty much an additional 500GB replacement substituted for the Kinect. The Call of Duty: Advanced Warfare bundle is available for pre-order now and you can grab it for £429.99/€499.99/$499.99. Tagged with 1tb, 2014, advanced warfare, bundle, call of duty, COD, console, Controller, decal, digital, download, exclusive, gamescom, hard drive, hdd, kinect, new, order, phill spencer, pre, xbone, XBox one.